Ducklings can eat chick food for the first few weeks of life. Since you can raise chicks and ducks together during their first weeks of life, it's convenient to keep them in the same brooder while thier feathers are coming in. They can eat out of the same bowls during this time, provided you take a few precautions to meet the safety needs of both species. 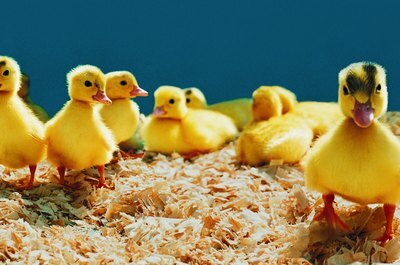 Chicks and ducklings should eat starter crumble for the first six to eight weeks of life. Feed starter mash to small-breed animals who may have trouble eating the larger crumbles. Select feed with the lowest protein content available, as too much protein can cause health problems in ducks. Use unmedicated feed, as ducks eat more food and could end up consuming toxic amounts of medication. After the first few weeks, chicks and ducklings can switch to grower pellets until they mature and begin eating adult food. While chicks peck at crumbles, then drink water later in their meal if at all, ducklings sip water to moisten each mouthful of food. Do not allow ducks to eat without an adequate amount of water available, or they may choke to death. Provide water in a pie pan or other container deep enough for ducks to splash in but shallow enough that chicks won't drown. You also put rocks in the bottom of a slightly larger container, provided chicks can drink without getting wet. Because ducklings alternate between food and water bowls, their food will become wet and prone to spoiling. Clean and change the feed pan daily to prevent potentially harmful bacteria from forming. The base of a terra cotta planter provides an ideal feeder, as it absorbs excess moisture, resulting in food staying dry longer. Position the food near the brooder's heat source to help moisture evaporate from the feed. Break food up with a fork should it start to become packed as it moistens. Turn your chicks and ducklings out in a predator-proof pen where they can peck at grass and other nonpoisonous vegetation. If an outside pen is not a possibility, sprinkle some grass clippings, dandelions or other fresh greens or vegetable peelings in their habitat. Chicks prefer greens distributed in dry areas where they can scratch and peck, while ducks enjoy greens sprinkled on top of a bowl of water. Fresh greens and plenty of water to splash in will help prevent pasty vents, which can prevent ducklings from eliminating their waste.